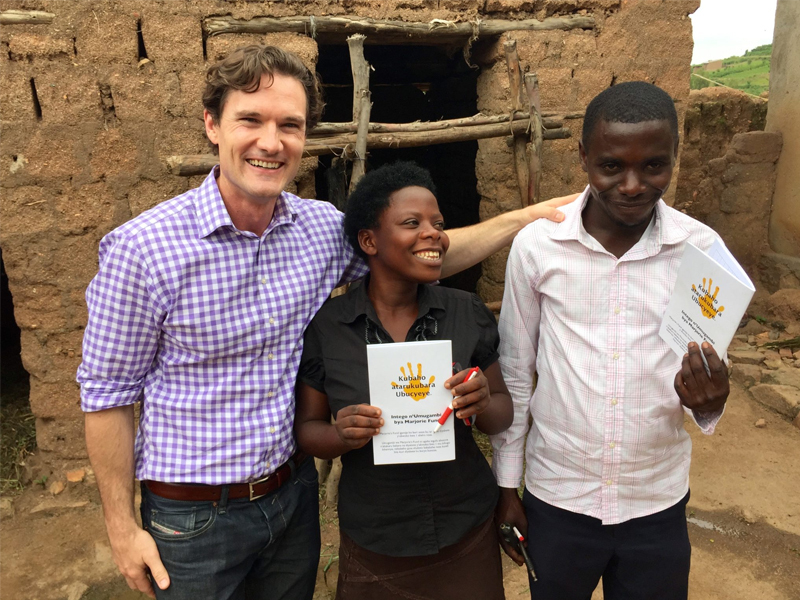 Dr Baker in Uganda with his patients. Jason Baker, an endocrinologist in New York City, and our own Editor-in-Chief, Douglas Villarroel, an endocrinologist in Santa Cruz, Bolivia, live with chronic illness. Jason Baker was diagnosed with type 1 diabetes when he was in medical school. Douglas had a kidney transplant when he was 27 years old during his medical fellowship. Since then, Jason and Douglas have been professionally treating the exact conditions they live with and manage day-to-day. Diabetes Voice asked each of these doctors how they might better understand a patient’s emotional and psychological experience of chronic illness. How do these two doctors forge alliances, provide care, master cooperation and motivation of the people who face the same challenges that they do – and stay above it all? We find out in the following interviews. When you were diagnosed with type 1 diabetes, you were in medical school. Can you explain why you chose endocrinology, specialising in diabetes? When I first started medical school, like so many students I wasn’t certain about my future field of interest. I knew I loved global health, and surgery. I completed a research program in Tbilisi, Republic of Georgia, the summer before my third year of medical school and became quite ill at the end of the summer. I am now convinced the virus I had led to my diabetes onset. My first rotation was trauma surgery, and it was then, I now know, that I started showing signs of diabetes. I assumed the weight loss was from my stress, and the increased urination from my high intake of coffee! I initially thought that practicing endocrinology would be overwhelming, that living and working in the same realm would not work. However, within a month, I was resolved to use my personal experience to guide my career path. I desperately wanted my unfortunate diagnosis to have a positive impact on my future care of patients, and I decided to become an endocrinologist. How hard was it to accept a life-long diagnosis, knowing all that you knew about medical science? I was shocked and scared stiff. My diagnosis happened right at the beginning of Thanksgiving break, so the majority of my friends had already left to go home. I went to the emergency room, and an attending doctor I knew gave me a textbook on DKA which wasn’t that helpful! I was finally admitted, and I remember lying in the hospital bed, alone and scared, calling my family to tell them I was fine and not to worry while trying to convince myself of the same. I was visited by a medical resident who asked me if I had frothy urine, and when I said I did, he told me it was from kidney damage and protein in my urine. This news was not delivered in a gentle or empathetic fashion, nor accurately (I have no kidney issues, time has shown). This scare tactic indeed scared me, and in some ways motivated me from day one to be vigilant with my own control so as to avoid complications, although I believe I would have come to that without the added stress put upon me by this person. On the other hand, it educated me that the same outcome could be achieved without scaring patients especially when they are feeling vulnerable and afraid. I like to think I practice this now, motivate and educate without the need to play upon fear. Were your colleagues and family surprised that you wanted to pursue caring for people with diabetes? Honestly no, I think they were in a way relieved, and it helped them also make sense of my diagnosis. Do you tell all your patients that you have diabetes, too? Initially I didn’t as I was afraid it would shift focus from them to me. Now I always tell people at the first visit, I find it helps put them at ease and to open up about what they are really struggling with. 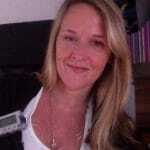 What is the hardest thing about living with type 1 diabetes and treating patients with diabetes? Keeping enough emotional distance that you can function in your job. I get the struggle and empathize so deeply it can become paralyzing, but I know that to do my job I need a level head. The patients in Uganda and Rwanda are such fighters, struggling to survive against all odds. I myself am motivated toward better self-care when I meet them and think of their struggles. What types of things do you feel require the most sensitivity with patients in terms of addressing their treatment, results, nutrition, weight or something else? Body image, depression and anxiety, and eating disorders. They are all such hot topic items. I try to gauge how in tune patients are with their own challenges, and find that most of my patients with type 1 diabetes struggle on some level with these issues. Do you believe most people are under-supported as they navigate life with diabetes? How does this factor affect your ability to successfully treat? It is part of my conversation with all patients to gauge who they have in their supports networks, how open they are with diabetes, how aware they are of resources available to them. I then try to individualize, based on their needs, next steps to help strengthen their network. What do you observe that most patients lack? Many patients are not aware of the intense stress they are under because of diabetes, and the ramifications on both quality of life and diabetes control. There are too few therapists and psychologists/psychiatrists, who really get the struggles related to type 1, and for those that exist, frequently appointments are scarce or insurance does not cover visit costs. If you had one thing that you wish all your patients would do, what would it be? Climb out of their diabetes comfort zones. This may mean trying a new treatment option or may mean making diabetes more visible to others (i.e. not to spend energy hiding diabetes but rather focus energies on fighting diabetes). If you could add anything to the current ADA guidelines on diabetes practice, what would it be? Put a higher emphasis on the need to self-monitor. The more people know their numbers, the better and more informed treatment and lifestyle choices they can make. I would also beef up the depression and anxiety sections and eating disorder sections since these are such huge issues for the type 1 population. You are founder of a Marjorie’s Fund. What do you see as the greatest difference between people in your practice and in Uganda? The diabetes patients I see in Uganda and Rwanda are thirsty for diabetes knowledge and are eager to use diabetes treatment and testing supplies when they are available but their access to education and medications/supplies is severely lacking. The patients in Uganda and Rwanda are such fighters, struggling to survive against all odds. I myself am motivated toward better self-care when I meet them and think of their struggles. If I ever just don’t feel like fighting the diabetes battle on a particular day, I am reminded I have an obligation to use the plethora of resources I have access to and they do not. It would be a slap in their faces if I did not. I find that sharing these experiences, and their stories, with other type 1s who have access to resources but are feeling burned out helps them to re-engage with their diabetes in a similar way. I think it helps to connect them to the larger diabetes community and feel less alone. After all, we are all part of the same diabetes community, and family must look after one another! Jason Baker is an Assistant Professor of Medicine and Attending Endocrinologist at Cornell Medical College in New York. Dr. Baker is involved in numerous global health diabetes projects, and has founded the non-profit organization Marjorie’s Fund, a type 1 diabetes global initiative dedicated to education, care, and research of type 1 diabetes in the developing world. At what stage in life and what age were you when you had a kidney transplant? I was ending my fellowship in endocrinology. I had spent all the years of my academic training coping with the consequences of the progressive deterioration of my renal function. I was 27 years old the day of my kidney transplant. What motivated you to go into medicine and specifically, diabetes? Without a doubt, my kidney disease played a very important role in my decision to study medicine. Early, at age 14, I was diagnosed with nephrotic syndrome, I had to visit doctors frequently, perform laboratory tests, ultrasounds, biopsies, etc. All that introduced me to a world that I have been passionate for all my life: medicine. Do you often explain to patients that you have a chronic condition? Very often I tell them that I had a kidney disease and that I live thanks to a transplant. That allows me a better connection with the patient, because suddenly I become someone who knows his suffering in his own flesh. The fact of seeing me so well after 25 years of being transplanted gives them a lot of hope! That moment in the office, when you deliver a diagnosis of diabetes or a serious complication, how do you do it and how does living with a serious chronic condition help or hurt your delivery? Many times, I am not sure if I see patients in a caring and understanding way, listening, explaining, taking time, because I have suffered from a chronic condition or because I am just like that. A decision I made from the beginning of my professional career is that I was going to get involved with the patient. I care for both their physical and emotional well-being. I always speak in an affective and careful way, using clear language. Making a diagnosis of diabetes for the first time or talking about serious complications has a great impact on people, just as it was with me in the various phases of my disease, therefore, my kidney condition has been of great advantage in understanding how to care for people. How many patients with kidney disease do you treat? Approximately 1200 patients per year. How many kidney transplantations have you overseen as the primary care or endocrine specialist? My greatest hope is that we find the cure for diabetes. Meanwhile, there is much to be done so that millions of people have better access to healthcare and first-level treatment at no cost. What is your definition of a good day with a patient who has diabetes and kidney disease? Uncertainty is what most affects a person with diabetes and complications. A good day is when he feels in control of what is happening to them. That is why people with diabetes need emotional support, information about their illness and to understand what is happening in their body. Do you believe living with a life-altering disease has made you a better doctor? Without a doubt, my disease has recharged my batteries to double, especially after the transplant. I live life intensely. I take advantage of every second and I give one-hundred percent to my patients. Although the fear of losing the transplanted organ never goes away, the spirit and the joy of living prevail. I have learned to listen to my patients with openness, to better understand their reality and what might happen to them. I became more humble and with a different perspective on life. What is your greatest hope for all people living with diabetes today? With all the research on diabetes and advances in diabetes treatments, it’s tempting to think someone has surely found a diabetes cure by now. But the reality is that there is no cure for diabetes, neither type 1 diabetes nor type 2 diabetes. My greatest hope is that we find the cure for diabetes. Meanwhile, there is much to be done so that millions of people have better access to healthcare and first-level treatment at no cost. What is the greatest reward of caring for people with diabetes? The greatest reward is to make a difference in my patients’ lives, both in the quality of life and in their overall health. Preventing or delaying their complications is key. The happiest day is when someone comes with their HbA1c below 7% or has finally started doing physical activity, and they feel empowered and confident about their future. Douglas Villarroel is a doctor specialising in endocrinology, an educator and Bolivian author. He had a kidney transplant when he was 27 years old which was made known at the national level when promoting the first liver transplant in Bolivia , and subsequently he has been active in the professional area. He is Director of the Humberto Parra Medical Center , located in the town of Palacios, 110 km from the city of Santa Cruz, where volunteer doctors from Bolivia and the US have been serving patients from 15 rural communities for 13 years, providing free medical care. medical, dental, ophthalmological, laboratory studies, medications, financial support in hospital care and health education. He is president-elect of the International Diabetes Federation for the SACA Region, 2019 to 2021, and Editor-in-Chief of Diabetes Voice. 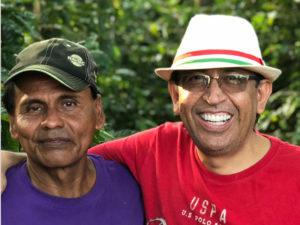 Douglas Villarroel with Don Pepe, the caretaker of the free clinic in the Bolivian countryside, with the clinic’s coffee crops in the background.